How Effective is Minoxidil for Hair Loss? Minoxidil – more commonly known by the brand name Rogaine – is the only topically-applied hair loss treatment approved by the FDA. Various trials have shown it to be effective at regrowing hair. However, no one actually knows how it works and doubts have been raised about how effective it is in the long term. So is it worth buying? Does it really work for hair loss? Minoxidil is a topical hair restoration agent. First approved in 1988 to treat androgenetic alopecia (male pattern hair loss), the drug was originally prescribed in oral form to treat high blood pressure. After noticing unexpected hair growth in patients, the drug was trialed to treat hair loss. When these trials proved successful, Rogaine was approved by the FDA for this use. Since then, the patent for Rogaine has expired and manufacturers are now free to produce generic formulations of minoxidil. Typically, these will be 5% concentration, although 2% solutions are also available. Available in liquid, foam, and spray forms, minoxidil is applied to the scalp twice daily – once in the morning and once at night. For maximum effect, it should be left on the scalp for at least four hours before being washed out. Like most hair loss treatments, minoxidil will only work for as long as you use it. As soon as you stop taking it, hair loss will return to how it was before. Despite being FDA approved to treat hair loss, nobody is entirely sure how minoxidil actually works. Currently, science says that the hormone dihydrotestosterone (DHT) binds to hair follicles and causes them to shrink. 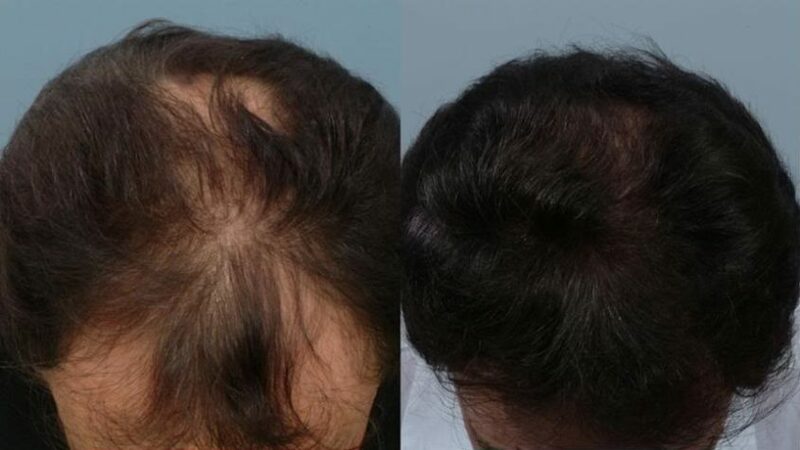 This is why DHT-reducing drugs such as finasteride are effective at slowing and reversing hair loss. But minoxidil has no effect on DHT levels. As minoxidil is a vasodilator, some claim that its hair-regrowing effects are due to increased blood flow. However, the link between hair loss and blood flow is disputed. Recent discoveries may shed light on to the mystery of minoxidil however. A recent Top Hair Loss Treatments article described the importance of prostaglandins in hair growth and androgenetic alopecia. And this paper proposes that prostaglandin activation (specifically PGE2) may explain the hair growth-stimulating properties of minoxidil. For now, though, the exact mechanism by which it regrows hair is disputed. So how effective is minoxidil? Even after the initial trials of minoxidil, the FDA concluded that the product will not work for everyone. This is still a somewhat impressive statistic. It is far more difficult to regrow hair than it is to maintain. Despite the ability of minoxidil to regrow hair, it is not likely to be effective at maintaining it as it does not tackle the root cause: DHT. As a standalone treatment minoxidil will not prevent DHT from binding to hair follicles and shrinking them. However it works, it doesn’t appear to slow the cumulative damage caused by hormones. But when used in conjunction with other medications – such as finasteride or dutasteride – it can produce some seriously impressive results. In some cases, patients may see significant and lasting regrowth. Because minoxidil is applied topically, rather than ingested, it is generally quite safe. More severe side effects include tachycardia (increased heart rate), chest pain, dizziness, fainting, and swollen hands and feet. Unsurprisingly, minoxidil is no miracle hair loss cure. For some users it can lead to dramatically improved hair – at least initially. For others, it has no effect or actually makes hair worse than before. If you do decide to try it out, my advice would be don’t rely on minoxidil alone. Though you may see an initial improvement with minoxidil only, the hair loss process will still continue if the underlying hormonal causes are not addressed. For this reason, minoxidil is best used in conjunction with other proven hair loss treatments. See Minoxidil reviews and success stories in the forum! Previous post: Is Prostaglandin D2 (PGD2) the Key to Curing Hair Loss? Next post: Do Sulfates in Shampoo Cause Hair Loss? Problem with minoxidil is even as you’re regrowing hair since it doesn’t address DHT…. over time you’re technically still balding so if you ever stop minoxidil, you’ll go to where you would be if you never took it at all which will be rapid hair loss and you’ll soon find yourself getting a hair transplant. It’s better to address DHT to stop the hair loss and see regrowth that will stay longer term. If you stop DHT reducing practice, you’ll start to lose hair but it will be as if it just started… it won’t be a radical amount of hair loss all at once. Thank you so much. Makes sense. Finasteride will cause breast development and sexual impairment. Don’t mess with hormones!